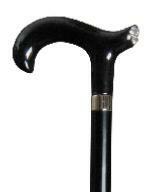 A very smart, formal cane, suitable for light to medium support and balance. The elegantly shaped derby handle is very comfortable to the hand and allows the user's weight to be supported directly above the shaft of the stick. The end face of the handle (the part most visible when the cane is held in the hand for walking) is set with Swarovski Elements and small, white metal embellishments, which together produce a pretty, sparkling effect. The black hardwood shaft is fitted with a smart chrome collar and a discreet, non-slip black rubber ferrule. Ferrule diameter 19mm.